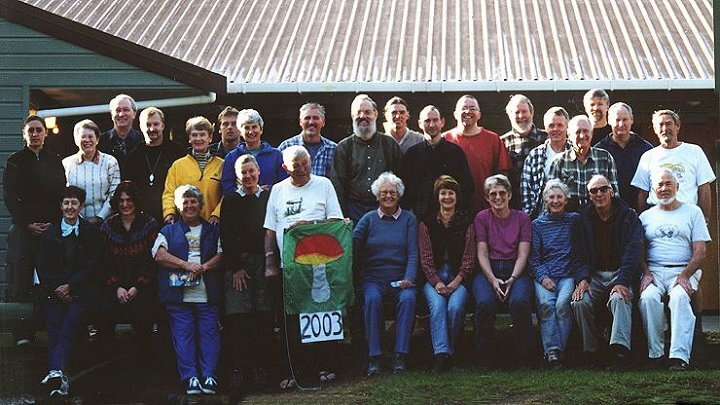 The 2003 Foray was held over the week 5-10 May 2003, based at the Aongatete Lodge (Kaimai Outdoor Centre), inland from Katikati. One of the reasons for choosing the Katikati area for this year’s foray was the lack of collections in the New Zealand Fungal Herbarium from native forests in the Bay of Plenty region. A search of the herbarium database for fungi from native forests in the Bay of Plenty area revealed only 100 species. Undoubtedly, the herbarium records provide a very incomplete picture of the fungal diversity of this region. For example, many of the species mentioned in Shirley Kerr’s ‘Exploring the Kaimai Bush’ website are not in the herbarium. This situation highlights the need for a formal repository for recording sightings as opposed to specimens of fungi. Despite being incomplete, the New Zealand Fungal Herbarium data at present provides the only authoritative, publicly accessible source of data on the distribution of New Zealand’s fungi with a country-wide focus. The Lodge proved an ideal venue, being central to the collecting sites targeted, as well as providing the facilities needed to house and feed the 49 participants, the space to examine and identify the collections made, and the recently constructed hall provided a venue for the Mycology Colloquium. The main sites sampled were the tracks around Aongatete Lodge, at the end of Lindemann Rd, at the end of Hot Springs Rd, Otanewainuku, Puketoki, dunes on Waihi Beach dunes, and the tracks to Orokawa Bay. Other sites visited included an orchard near Bethlehem and CHH Athenree Forest. Weather conditions meant that the autumn of 2003 was unusually poor for collecting fungi, the season being later than usual, and the dry conditions meaning that many collections were small and in poor condition. Despite this, 146 species of fungi new to the Bay of Plenty were collected. Prior to the Foray, 100 species of fungi were known from the Foray area. During the Foray, 153 species of fungi were found, all but 6 of them being new records for the area. Fungi of interest included an undescribed Lachnum species. This small, dark, hairy discomycete was collected from the fronds of Cyathea medullaris. This fungus has only ever been found once before, on tree ferns fronds in Queensland. Many of New Zealand's discomycete fungi also occur in Australia, and further collecting will undoubtedly reveal more such 'Australian'; species in New Zealand. Amongst the small hyphomycetes were 6 species previously unreported for New Zealand, and the second only record of the still undescribed Zanclospora ‘ureweri’, a fungus first discovered during the 16th Foray at the Urewera National Park. One 'sand dune' fungus was new to New Zealand — the mushroom Psathyrella ammophila was found on the dunes at Waihi Beach. There are a group of mushrooms and puffballs specialised to life in sand dunes. Past collecting has shown Matakana Island to be particularly rich in these fungi, but unfortunately we did not get to the Island during this year's Foray. One of the aims of the Foray is to increase public awareness and understanding about the fungi of New Zealand. The 17th Foray achieved this through news items run by TV3, TVNZ, Radio Rhema, and Radio New Zealand, and visits to the Foray by Matahui Rd School, Katikati College, and Junior College (Auckland). Articles about the Foray appeared in New Zealand Growing Today (August 2003), Forest and Bird (August 2003), the Hauraki Herald (6 May 2003), and the Bay of Plenty Times. Dots, spots, lumps and ... oh! what's that smell? The New Zealand Fungal Foray is an annual event held in May each year at a different site in the country. It is intended for both amateur and professional mycologists. The amateurs range from members of the public with a general interest in natural history, to photographers, to gastronomes, to those with an extensive knowledge on New Zealand's fungi. Initiated in 1986 with a foray at Kauaeranga Valley, Coromandel Peninsula, the event has since been held in such varying places as Tangihua, the Catlins, Wanganui, Ruatahuna and Haast. The Foray is organised by a loose group of people, the organising group often changing from year to year. It has always been strongly supported by the mycologists at Landcare Research. This year's Foray, the 17th, was held from 5-10 May in the Kaimai Ranges, Bay of Plenty. Accommodation was at the Aongatete Lodge, Kaimai Outdoor Centre, 18kms from Katikati. There were between 20–40 people on the Foray, depending on the day and activities. For me getting to the Foray meant an early start - 5.30am to catch a 7.15am bus to the 8am boat to Auckland, where Clive Shirley was waiting to pick me up for the drive to Katikati. We arrived at Aongatete Lodge around 3pm after a couple of stops along the way to hunt for fungi. The first stop was Broken Hill on the Tairoa River, where we saw a lovely display of Dawsonia superba, in one place densely packed like a low hedge. After this there was a lunch stop at a dawn redwood (Metasequoia glyptostroboides) forest, where we found a groups horse mushrooms (Agaricus arvensis). Clive and I decided to go for a short walk before dinner to see what fungi we could find before the other forayers arrived, so we took a walk round the Short Loop Track. The forest was predominantly tawa (Beilschmiedia tawa) with kohekohe (Dysoxylum spectabile) and scatted large puriri (Vitex lucens). By the track could be seen a sea of miniature tree fern (Blechnum fraseri), crown fern (Blechnum discolor) and Coprosma spatulata. Bushman's mattress (Lygodium articulatum) was a frequent climber. By the side of the track there was a 3m ponga with a rimu (Dacrydium cupressinum) and a kiekie (Freycinetia banksii) growing from halfway up the stem. Common fungi we saw were wood ears (Auricularia polytricha), white pore fungus (Favolaschia pustulosa) and orange pore fungus (F. calocera). some specialist areas of study. On this, our first day of group foraying, we split up into two groups, half going to Puketoki Reserve and the other half going to the Linderman Pack Track. Clive and I went to Puketoki Reserve with the TV1 crew, where the film crew took film footage of some fungi and interviewed some of us. The TV3 crew met the other group at the Linderman Pack Track later that morning. Puketoki Reserve consists of tawa forest with a fairly open understorey of wheki (Dicksonia squarrosa), ponga (Cyathea dealbata), pigeonwood (Hedycarya arborea), kanono (Coprosma grandifolia) and scattered crown fern (Blechnum discolor). There were fine colonies of perennial bracket fungus (Ganoderma australe) on dead and dying tawa trunks, one of which featured in the TV1 news item. One specimen on a fallen tree trunk had continued to grow at right angles to the original 400mm wide fruiting body. A special feature for me was seeing large quantities of shaving brush fungi (Trichocoma paradoxa) on the remains of a tawa that had split about 4 metres up the trunk. Wax gills (Hygrocybe firma, H. rubrocarnosa, H. cerinolutea) also featured on the forest floor that day. That evening David Orlovich, University of Otago, showed slides of his trip to china, touring the country and visiting mushroom farms and trying various fungal recipes. There are upwards of 200 species of fungi sold on the market in China as a food. Then Angela and Ron Freeston showed a series of slides designed to prompt audience participation in identifying fungal species. The Colloquium is an event started at last year's Foray, a day set aside for talks on various fungal subjects. Three of our number went foraying in Otanewainuku Reserve, the rest stayed for the talks. First up was David Orlovich who spoke on the subject of molecular diversity and the failure of taxonomy. Of the estimated 20,000 or more species found in New Zealand, only 4,000 have been described. Of the 6,500 species recorded for New Zealand, half have been introduced and many of the known species have only been found once or twice (Peter Johnston pers comm). Worldwide there are some 1.5 million species of fungi, one of the most diverse kingdoms in nature. David spoke on the pros and cons of using DNA sequencing rather than traditional taxonomic methods for identification of fungi. Next up was Dan Mahoney, speaking to slides of dung fungi found in Queensland. He was followed by Don Horne, author of Mushrooms and Other Fungi of New Zealand, who talked about the survey work he has been doing in Walter Scott Reserve managed by Waikato Forest and Bird. He started going there in 1984, recording and photographing the fungi found there. The reserve is home to the endangered golden basket fungus (Clathrus chrysomycelinus), one of the few sites where the species is found. Don has been recording the quantity of the species appearing each year and the months it was seen. After morning tea Tod Ramsfield, University of British Columbia, talked on the work being done to control lodgepole pine dwarf mistletoe (Arceuthobium americanum), a parasite indigenous to the province that affects lodgepole pine (Pinus contorta), British Columbia's only native two-needled conifer and widespread throughout the province. A. americanum is common wherever lodgepole pine is present. Where the mistletoe appears in plantation forests native fungi (Colletotrichum gloeosporioides, Caliciopsis arceuthobii) that parasitise the mistletoe are being introduced. These areas are geographically removed from areas where the mistletoe is present in conservation areas (where methods are being looked at to control the fungal parasites). Next Jerry Cooper gave a critical assessment of the NZ MAF Unwanted Organisms Register of Names. There are 4,642 fungi and 333 bacteria on the list, of which 4 fungi species are classified as notifiable organisms. However, an analysis of these names shows that many of them are not recognisable as fungal species, or are incorrectly spelled or are duplicate entries. Despite the procedures MAF has to gather information many entries are incorrect and many potential pests are not on the list. Rebekah Fuller, a Masters student at Auckland University, then spoke on her thesis subject, Maori knowledge of fungi. Fungi make up one third of New Zealand's biodiversity. Maori had information on the life cycles of fungi and had a system of taxonomy. The uses they put fungi to included a food source, ink for ta-moko, dyeing, medicine, a remedy for poisoning, a source of income and as a means to carry fire. A lot of this traditional knowledge has been lost. Of the 174 Maori names for fungi and 13 edible species known only 14 Maori names and 7 edible species are known today. Peter Austwick finished off the morning with a talk on Lepiota nauseosa (which he nicknames "noddy caps" due to it's peaked cap), a fungus that smells like vomit. It forms large fairy rings in Shakespeare Regional Park. The fungus mostly lives underground as a mass of hyphae forming the mycelium, the mushroom being the fruiting bodies on the edge of the fairy ring producing the spores. Lunch, and then Pam Catcheside spoke on the fungi of South Australia, followed by Stephen Whitton on the introduced "weed" orange pore fungus (Favolaschia calocera). Apart from New Zealand, F. calocera has been recorded in Australia, China (Yunnan Province), Italy, Kenya and Madagasca (type locality). It was first recorded in New Zealand in 1969 in the Auckland and Waikato regions, and is most likely at its southern climatic limit in this country. The most southern point in New Zealand where it is found is Haast. It is very adaptable and found in many habitats, primarily native and introduced hardwoods. 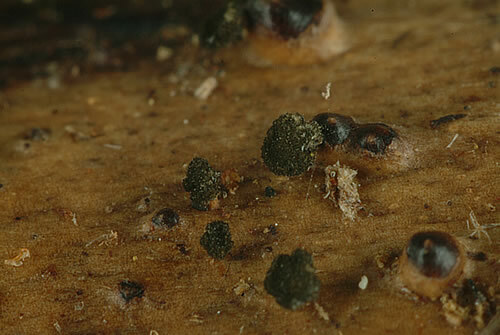 Every new spore is capable of establishing after a suitable wood host is found and for this reason is very successful and prolific, though it does not appear to be replacing native fungi. Then came Ian Hood, who spoke on wood decay fungi in Whirinaki. Peter Buchanan, Landcare Research, was next with some statistics on threatened fungi species. Until 2002 New Zealand fungi were not recognised as threatened. Now 14% (1 in 8) of the list of Nationally Critical Species are fungi. There are 49 nationally critical species, which are limited to large, easily collected and distinctive fruiting bodies, and 16 species are in lower threat categories. There are 1200 species data deficient and 2500 species recorded in the country but known from less than 4 collections, and of these more than 1500 are from a single collection. So there is a lack of material to really get a handle on the degree of threat posed to fungi. The final two speakers of the Colloquium were Toni Atkinson on wood decay fungi and Geoff Ridley on spots and dots on leaves, and lumps on stems. Geoff described one as yet unnamed species found on beech trees that has a distinctive yeasty smell. Ten children from Junior College in Auckland with their teacher Chris Deeley arrived that day. 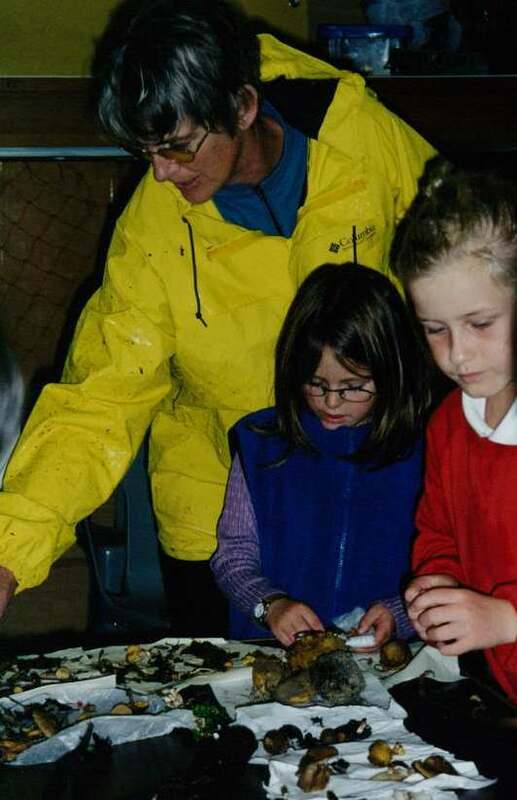 Chris gained a Royal Society scholarship to work with Landcare Research in the Herbarium for 2001 and has retained a very strong interest in fungi ever since. After the Coloquim we helped them identify their fungal finds from the early afternoon. They slept that night and left lunchtime on Friday. A reporter from the Katikati Advertiser was there to do a story and take photos. At dinner time there was a chance to taste birch boletus (Lectium scabrum), with leftovers for those wanting some for breakfast the following morning. After dinner a talk by Carl Soop on Cortinarius species rounded off the day. Most of the forayers went off to Athenree Forest, a pine forest. Clive and I, however, decided to check out a small lifestyle block, whose owners had contacted the Fungal Foray to say they had some colourful mushrooms on their farm. We thought they would be fly agaric (Amanita muscaria) - and sure enough we found some there - but went anyway. It was a worthwhile trip. Among the avocado pear orchard lilac puffball (Calvatia cyathiformis) was plentiful and growing to about 200mm diameter. Stropharia aurantiaca and dung-loving Psilocybe (Psilocybe coprophila) were common among wood chip mulch. An interesting find was a couple of fruiting bodies of Melanoleuca arcuata growing in grassland. 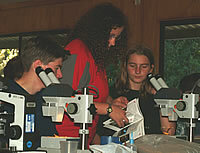 Students from Katikati College spent several hours at the Lodge, foraying along the Short Loop Track and then they used the microscopes for the afternoon. After dinner Shirley Kerr showed slides on wax gills and Don Horne showed various fungi slides. swathes of kiokio (Blechnum novae-zelandiae) dominated the ground tier. Students from Matahui Primary School came for the afternoon to foray, collect and then use the microscopes. That evening was a time for relaxing and planning next year's Foray, which will be held in the Nelson area. There is also an alternative species list here that was taken from the former foray site on the landcare Research website. Panaeolus papilionaceus LT Pleurotis sp. The 17th New Zealand Fungal Foray was held at the Kaimai Outdoor Centre near Katikati during the second week of May. The Foray's mission is to promote the understanding and study of fungi by the wider community. Approximately forty forayers attended and included a strong contingent of enthusiastic amateurs, both first timers and old hands, as well as professional mycologists from Forest Research, Landcare Research, Otago and Canterbury Universities, and from South Australia and Sweden. 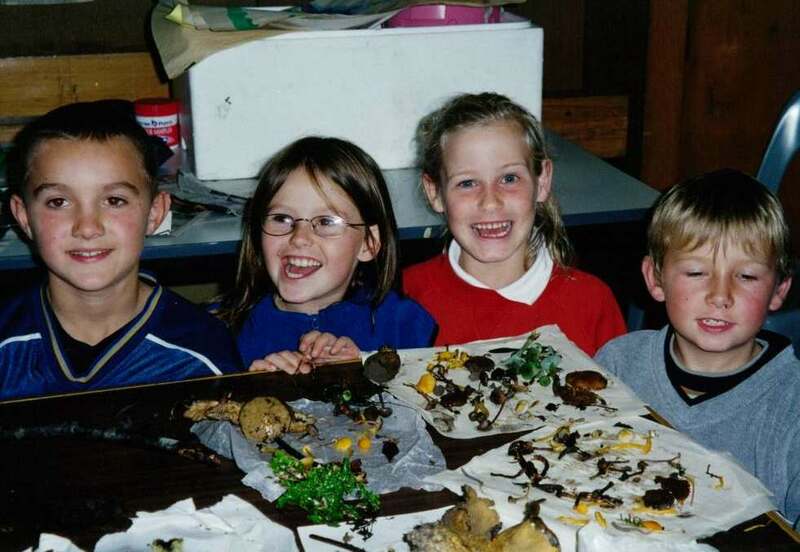 Numbers were further swelled by groups of school children who took part in short hands-on educational programmes designed to excite an interest in fungi. Previous Forays have largely focussed on native forests so when Simon Anderson and Grant Spencer, Carter Holt Harvey Forest Resources, invited the Foray to Athenree Forest the opportunity was taken up with enthusiasm. The party spent the morning collecting in a 22-year-old Pinus radiata stand with a dense understorey of silver fern while after lunch the group picked through the decomposing slash of a recently felled eucalyptus stand. All up around fifty collections were made and are now being identified. Although a great deal has been published on the fungal pathogens of New Zealand's plantation forests there has been little written about the biodiversity of mycorrhizal and decay fungi that are essential in any sustainable system.